Well, here we are on the last day of July. Personally, it was not a great month for me, though there were definitely high points (thank God! ), as there are in even the worst times. It was way too hot and humid for too many days (nearly all of them) during the month, so that didn't help. But I made it, you made it, and that is always a good thing, right? I decided to end the month by sharing another recipe. I found this at Budget Bytes, and if you have some time to make it, you'll thank yourself on mornings when you are either rushed, or just uninspired. I feel like it's an excellent template to use with whatever ingredients you might want to add, but it's also really really yummy if you just follow this recipe. Even The Tim, who thinks making egg things ahead is silly, "because how long does it take to cook an egg?" finds these tasty, though I think he'll mainly leave them for me to eat since fixing something like this for myself on a weekday morning would be way more effort than I'm willing to make! Preheat oven to 350 degrees. In a large bowl, whisk together the eggs, milk, salt, and pepper. Thaw the spinach, then squeeze out as much excess moisture as possible. Take the peppers out of the liquid in the jar, and slice into smaller pieces. Stir the spinach and peppers into the egg mixture. Coat an 8 x 9 or 8 x 12 inch casserole dish with nonstick spray. Pour the egg and vegetable mixture into dish. Bake for about 30 minutes, or until the center is set and the outer edges are slightly browned. Allow the eggs to cool completely, then slice into six pieces. Build the sandwiches by adding one piece of the baked eggs and one slice of cheese to each English muffin. Wrap each sandwich in plastic wrap or a fold top sandwich bag, then place all sandwiches into a gallon sized freezer bag. Freeze for up to 2 months. To reheat, unwrap the sandwich, place on a microwave safe plate, and microwave on the defrost setting (or for 1 minute if you don't have that setting). Then heat on high for 30 seconds at a time until heated through. *** Or, thaw in the refrigerator overnight and microwave on high until heated through. Let me know if you try this, and if you liked it. Enjoy, and I'll see you in August! Last weekend, we had out-of-town company. Our friends Dave and Dixie came for the weekend. It's been a while since we've seen them. We usually catch up when we are home in WV, but we have not been home for a while - this Memorial Day we'd planned to go, but Dug wasn't doing that great, so we stayed put. We were excited they decided to come, since we always have a good time with them, and they haven't visited for a long while. We met Dave in college and became friends. He had a job and a car, so of course he was a good person to know! :-) Then after college, he met and married Dixie, and we have been close with them and with their kids (now adults) since. It was HOT here last weekend! As in, 90+ degrees plus oppressive humidity (with "feels like" temps of 100+). Ugh. We weren't sure what we wanted to do, since none of us were anxious to spend time outside. 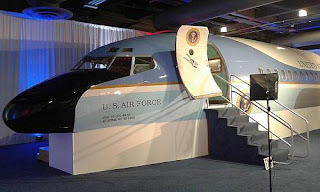 Enter Politicalfest 2016. As you likely know, the Democratic National Convention is in Philadelphia this week. 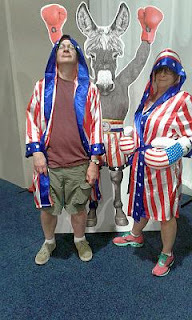 Well, Politicalfest is a week-long event, where you pay a single fee ($15.00 for adults), and you have access to each of the events for the whole week. 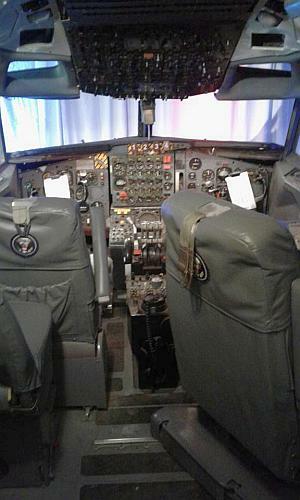 There are seven different locations that have created special exhibits related to the race for President and political history, and shuttle buses to take you from one place to the next. Fortunately, our guests wanted to go (they chose it from a list of choices we'd given them), so we started off bright and early. Here are some of the highlights from the various locales. The first handwritten draft of the Constitution, by James Wilson. (Sadly, the photo of the card describing it turned out, and the document photo didn't). 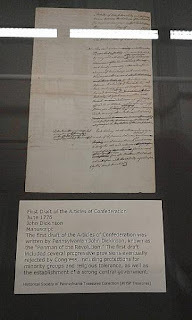 The first draft of the Articles of Confederation, by John Dickinson. One exhibit was about the fight for voting rights and the Civil Rights Movement. I remember seeing this kind of thing as a child, once on vacation, and being so confused. Chairs! We saw lots of chairs. 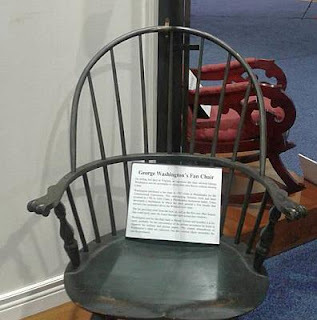 George Washington's fan chair. A foot treadle activated a fan above! 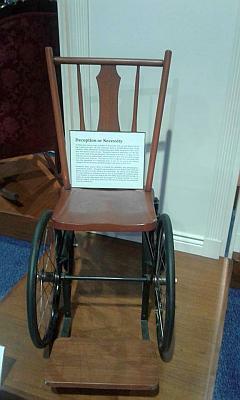 FDR's "public" wheelchair. It was specifically made to fit into the opening of his desk. We saw one of Mary Todd Lincoln's inaugural dresses. Apparently, she spilled a drink on her first dress, so this was made as a replacement overnight! 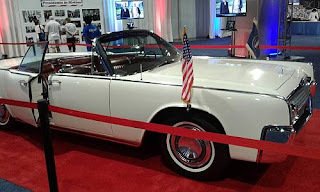 There was the car provided to JFK and Jackie on their trip to Texas. 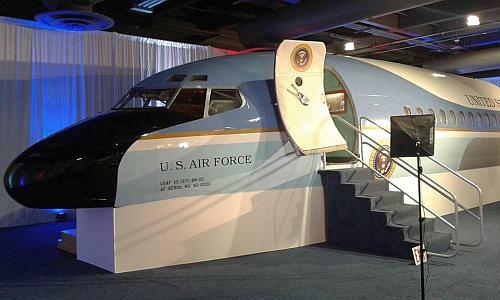 Also, a replica of Air Force One that brought the Kennedys to Texas on November 22, 1963; and the room where the body of JFK was on the flight back to DC. 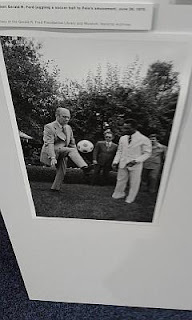 This photo of Gerald Ford kicking a soccer ball with Pele amused me greatly! 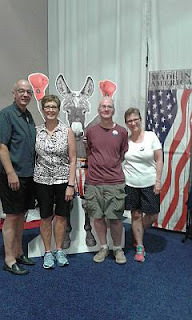 We posed with our friends in front of the DNC "Rocky" donkey. It was a blast, it was interesting, and it was a wonderful way to spend the day. I would have wanted to go, even if we had not had company, but I think they are likely to remember it for a while. It would have been hard for us to cover so much ground and visit so many places in one day otherwise. Ugh. To quote my mother, "It's hotter than Billy be d*mned." I don't know who Billy was, or why he was in that situation, but that's just how hot it is. For Ten on Tuesday, Carole wanted to know 10 ways to keep cool in the heat. I'm not participating this week, because the heat and the humidity make me so incredibly miserable and cranky that all ten of my answers are GO BACK TO WINTER. 1. You are getting yarn in the mail today as a gift. Tell us about it. 2. You are knitting poolside. What are you ordering from the cabana boy. A margarita. That also means I'll have to stop knitting though, if I don't want to tear it out and re-knit it later! 3. You are asked to give a 5 minute presentation about any aspect of knitting at all. What is your topic? 4. You can ask a knitter to finish any of your WIPs. Which one is it? I would have to decide between my Custom Fit sweater or a shawl I have on the needles. Mistakes were found in both after I'd knitted way beyond said mistakes, and I have lost the will to pull out and/or re-knit after that, at least for now. 5. You take good care of your hands. Are your nails short or long? Join along in the comments, if not on your own blog, and let us know what your answers are to these questions. It's fun! Try to keep cool, everyone. 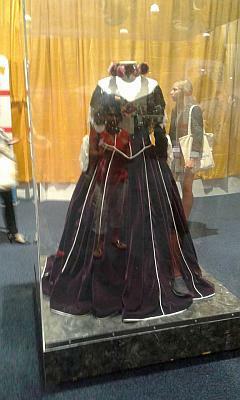 Well ... after a fashion. For this week's Ten on Tuesday, Carole wants us to list 10 Songs About Where You Live. She mentions that we might have to get creative, and she wasn't kidding! I decided that I would include songs about where I live now (city AND state), and also where I was born and spent much of my growing up years (again, city AND state). Fortunately, my love of musicals and having parents who sang and listened to a lot of old songs and liked sports helped out here. 1. Sit Down, John! 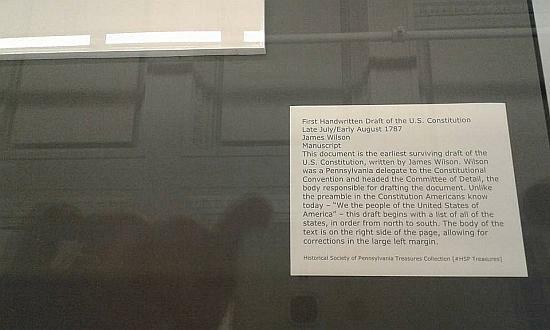 (from "1776"). Fun fact: When we lived in Chicago, The Tim was in a local production of this show. He played James Wilson, the Pennsylvania delegate whose vote was pivotal. 2. Philadelphia Freedom, by Elton John. *10a. Out of fairness, I must include the fight song for WVU (West Virginia University), if I'm including the Pitt fight song, and again, you ended up knowing this whether or not you wanted to. Personally, June was one of the worst months this year for me personally. I barely knit a stitch of anything, and sadly made nothing to contribute to this project. But - fortunately, two lovely people kept their needles clicking away, and added to the total for Harry's Hundred. I have to say, they are both "repeat offenders" and I am grateful for their contributions. Not just so that the number of items increase, but because it means that people will be receiving items that they would otherwise not have, that can keep them warm, and hopefully make them feel that someone cares. Without further ado, I present the additions from June. Kim is not just a dear friend and a wonderful person, but a prolific knitter and someone who will make many people feel the love with her knitted items. 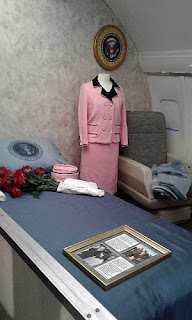 She sent me these photos so I could add the items to the overall tally. 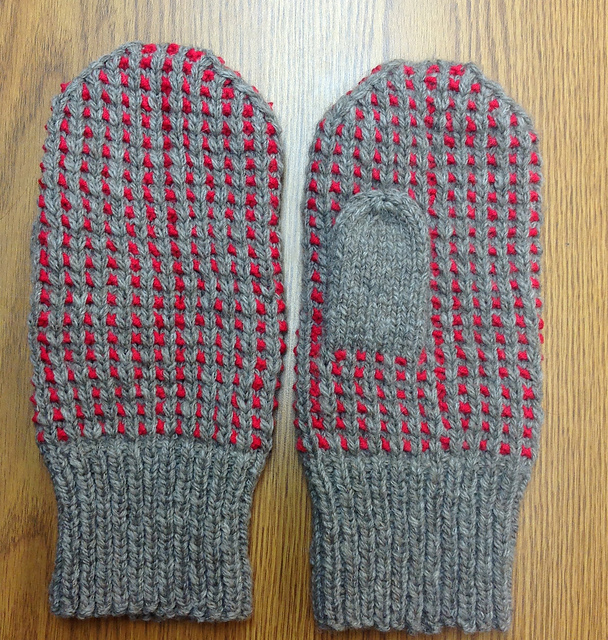 A beautiful pair of gauntlets (with fancy button detail! 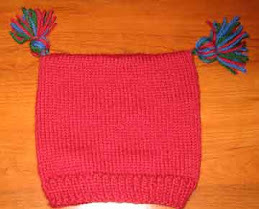 ), and a hat and scarf (the scarf has some of my most fave colors, btw). I think we can agree that these will bring a smile to some faces, right? Next, a woman I now only know via Ravelry, but whose contributions are making a really big difference each month in the totals, GringaTurista (Rav profile link). More cozy mittens! Thanks to these ladies for their efforts and continued contributions. I really and truly cannot express how happy it makes me to learn that others are participating. I have plans for July and especially for August, since that is the actual month of my dad/Harry's 100th birthday. But even if nothing else happens on the part of me or anyone else, I think Harry's Hundred has already been successful - anything at all that has been made and contributed or will be contributed is a commitment to help our fellow humans. And these days, every little thing makes more of a difference than ever. Hello and Happy Bastille Day! I am not French, nor do I play a French person on TV, but I have always been interested in France, and took 8 years of the language in high school and college. I've only made it as close as Montreal, but that was fine, as I do love Montreal and Canadia (as we call it) in general. Anyway, I hope you have a lovely day no matter what. I'm behind on some of the things I wanted to post, so it's time to get going, right? First up, what I read during the past three months. A Man Called Ove by Frederik Backman. I listened to an audiobook version of this, and I have to say, I can see myself reading the actual book sometime in the future. The author, and the person who translated this into English, gave the reader/listener a story that had so much to love, to laugh at, to understand, and to just enjoy. The main character, Ove, is a widower who has been let go at his job. He finds himself lonely for his wife, as well as at loose ends figuring out what should come next. He is a curmudgeon, and lives his life strictly by the rules, with no wiggle room for anyone else, either. Then a stray cat, and new neighbors enter his life. The neighbors are a couple with two young girls, the wife is pregnant, and Ove finds the husband to be hopeless in his opinion. Without really meaning to, they involve them in their lives. Without really meaning to, he ends up with the cat as his constant companion. No one will leave him alone, to do what he has planned ... which is to kill himself. I enjoyed every single sentence of this story. I enjoyed the characters, the way things moved along, and the bittersweet ending. Ove is one of my favorite characters ever, and also one that reminds me of people I actually know and have known. I'm not willing to say much about this book otherwise, because frankly I loved it and feel that some parts of it will stay with me for a long time. Worth every single minute of my time. Books Can Be Deceiving by Jenn McKinlay. OK, so this is a series where the main characters are librarians. So sue me. Lindsey Norris is the fairly new director of the public library in Briar Creek, Connecticut, thanks to her best friend and grad school pal Beth, who is the children's librarian there. It's a change of pace for Lindsey, who was formerly at the Yale Beinecke Rare Books Library. She needed and wanted a change after discovering that her fiance, a law professor, was having an affair with one of his student assistants. She is getting used to the place, and making friends, particularly through crafternoons at the library, when a group of friends gather to knit, crochet, etc., and discuss the book of the month. Things seem to be going smoothly, until Beth's boyfriend (a children's book author and illustrator, who Lindsey has never liked) turns up murdered. Beth becomes the prime suspect, as she had recently claimed that he plagiarized some of her work. Lindsey and Beth go to work trying to locate the real murderer and wanting to clear Beth. This was a fun read. The small, seaside town sounded appealing, the characters were interesting to meet, and when Lindsey and Beth made a startling discovery about the late boyfriend, it was fun to see how they dealt with it. Not Shakespeare, but enjoyable. I will likely give the next book in the series a try. A Cat Was Involved by Spencer Quinn. An enjoyable, very short story for fans of Chet and Bernie. This is the story of how they met and started working together, after Chet flunked out of K-9 police training on his last day. It was the fault of a cat, but it helped Bernie solve a case. As usual, Chet's narrative is highly amusing. The Beautiful Mystery by Louise Penny. Another strong book in the Inspector Gamache series. Inspector Armand Gamache and his right-hand man, Jean-Paul Beauvoir, are in a unique position. They are at a secluded, private, little-known monastery, where no outsiders have ever been allowed. Until now. One of the monks has been murdered, and Gamache is sent to find out who in the small community is the guilty party. The monks had not long before released a CD of their singing. They specialize in Gregorian chants, but not the kind most people know - no, they are singing some of the original types, written using the most basic musical notation. The CD was a huge success, bring them much needed funding for the monastery, but also a nosy public. The murdered monk was the one who was the choir director, and who was trying to get the abbot to agree to make another CD. Thus sets up the story. Gamache and Beauvoir learn some of the secrets of a community of men who seldom if ever speak, and never see or talk to people from outside their walls. Some of the monks want to make another CD, others prefer to return to their quiet and contemplative existence and leave the one recording as their legacy. 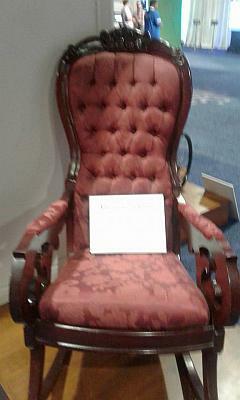 At the same time, Beauvoir is dealing with his demons, having only recently recovered from an addiction to OxyContin. Gamache also has his demons, in the person of the Superintendent who shows up unexpectedly and seems to be there simply to challenge Gamache. His reasons for being there are only slowly revealed. This was a good read, with wonderful descriptions of the monastery, and the rituals followed by the monks. Gamache and Beauvoir become even more real, complex, and flawed people to the reader, and you want only the best for them. Granted, my faves are the ones set in Three Pines, but this was a wonderful book. At the Edge of the Orchard by Tracy Chevalier. I've had a Advanced Reader's copy of this book for a while, and finally decided to read it. I haven't read every single one of Chevalier's books, but I've enjoyed the ones I have read. This one is exactly what my star rating says: it was OK.
What I liked: the story of the Goodenoughs, a family who settled in Ohio in the 19th century, hoping to grow an apple orchard, using seedlings from the husband's family's business in Connecticut; the characters interaction with John Chapman, aka Johnny Appleseed; the story of the oldest son of the family once he "escapes" and works to carve out a life for himself; the descriptions of life in California during and after the gold rush, when it was barely populated. What I didn't like: James and Sarah, the Goodenough parents, who were completely unappealing characters; the lack of story about any of the rest of the family; the way the story seemed to plod along, even in the interesting parts. In my opinion, this book and this story had a lot of possibilities. I'm glad I read it, and it was interesting enough to finish. But I just didn't end up caring much for any of them, and I think Chevalier missed the mark here. The Diva Digs Up the Dirt by Krista Davis. I enjoy this series, and was in the mood for something lighter. It did not disappoint, though I have to say there was a little more complexity to this particular book than to others in the series. This time around, Sophie Winston decides to do something nice for her boyfriend while she is on vacation, and goes to his yard to plant a special rosebush she knows he will like. Problems start when she digs up a woman's purse and a knife buried in the boyfriend's back yard. Things get worse when the purse proves to be that of her boyfriend's wife, who disappeared mysteriously a few years before. As if that isn't all bad enough, the woman's mother tracks down Sophie and expects her to investigate the case. And one of Sophie's clients is being poisoned. Bodies and mysteries are turning up all over the place. As I said, this book is a little bit more involved and complex than the previous ones. But it manages to work in a normal fashion as part of the overall stories of the characters, and adds something to the mix for the future of the series. Henrietta's War : News From the Home Front, 1939-1942 by Joyce Dennys. I've had this book on my Nook for a while, but just got around to reading it, and I'm so glad I did! The book is a collection of letters from Henrietta, who lives in a village in England during WWII, to her "dear childhood friend," who is serving at the front. She is writing to let him know that he is in her thoughts, but also to keep his spirits up by telling him how her family and others' in the village are doing. The letters are, for the most part, short. 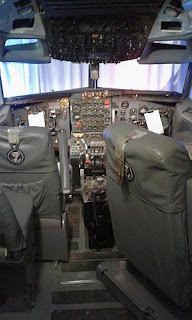 But they are chock full of information, and details of daily life. We are introduced to the other people in the village, but particularly those that Henrietta sees/talks to most often: Charles, her husband and a doctor; Faith, a dear friend; the Admiral, an admirer of Faith's; and Mr. and Mrs. Savernack, who seem to be the arbiters of right and wrong among the locals. The letters are a wonderful collection of stories about everyday life, small slights and disagreements, funny things that were done or said, and also just give you a sense of what people felt and thought during this time, when everything seemed both uncertain and still the same. To a small extent, I was reminded of some of Barbara Pym's stories and characters. This is a lovely, fun book, and one that you can pick up and put down easily if you don't have a chance to sit and read for long periods of time. Ordinary Grace by William Kent Krueger. Such a lovely book. The story takes place in 1961, in New Bremen, Minnesota. 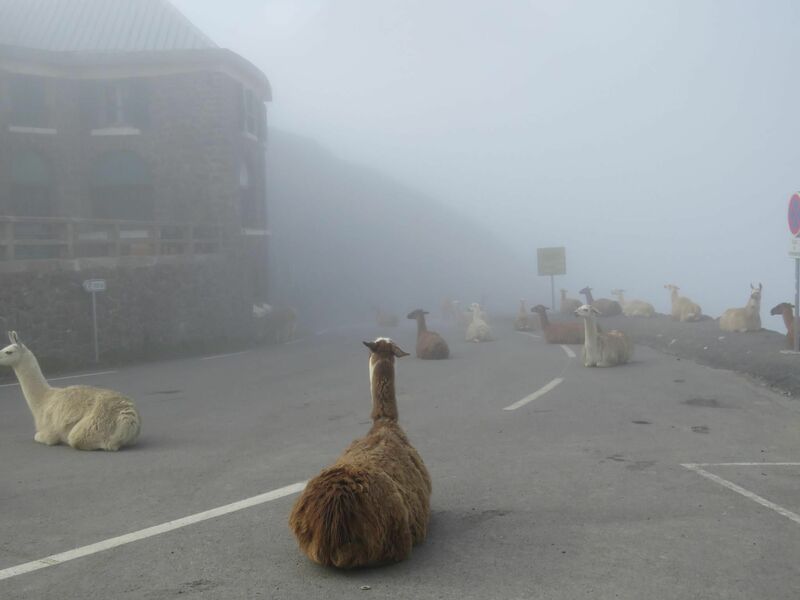 It's a small town that during the summer of that year, will see things happen that no one can ever remember happening before. The narrator is Frank, who at 13 years old is the oldest son of the town's Methodist minister. Frank's family is pretty happy: his father is involved in his work and respected, his mother is a talented singer and popular at their church, his older sister Ariel is getting ready to attend Juilliard, and Frank and his younger brother Jake just want to enjoy the summer. The Minnesota Twins are playing their first season of baseball, and the whole summer is just waiting for them. When one of their friends is killed on the railroad tracks in town, no one even suspects that the rest of the summer will lead to more death, more questions, and more secrets. This is a wonderful read. The writing is so evocative, and the story is leisurely (like a warm summer's day) without being boring. Though sad, the overall theme of the book is hopeful and reminds us that the most ordinary things can be the most amazing. Pleasantville by Attica Locke. The action in this book takes place in 1996, in Houston, Texas. Pleasantville (which actually exists) is a neighborhood sort of like a Levittown for blacks - created in 1949 and providing homes for black families, many who still live there after becoming successful professionals in the brave new world. The story takes place during an election for mayor, where a long time Pleasantville resident who is currently the police chief is running against the district attorney. 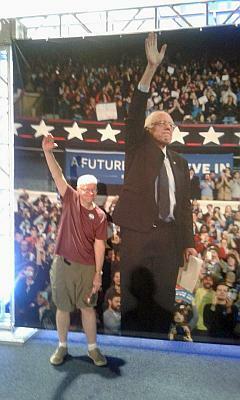 Jay Porter, the main character, is still getting over the "new normal" of his life now that his wife Bernie has died and he is raising their son and daughter on his own. At the beginning of the book, he is winding down his law practice, having lost interest in nearly everything and wanting to just burrow away. But when the campaign manager for Pleasantville's candidate (who is also a member of that prominent family) is arrested and charged with the murder of a young campaign worker, Jay ends up involved - begrudgingly at first, but later fully invested in proving his client to be innocent. There are several back story parts to this - chemical companies dumping waste near Pleasantville, new families (mostly Hispanic) moving in when others move up and out - and I think they may have been fleshed out more in Locke's previous book featuring Jay Porter. But not knowing all of that does not in any way take away from this story. This is a story of dirty politics and shady deals. George W. Bush and his political ambition plays a part, and the book ends on Election Day 2000, when everyone is wondering how the Bush/Gore election will play out. I enjoyed this book, even if sometimes I lost track of the small details. The intrigue and the political dealings are both amazing and upsetting. If you like crime stories and politics, you will enjoy this book. Mothering Sunday by Graham Swift. On a lovely spring day in March 1924, Jane Fairchild, a 22-year old maid from a neighboring estate, spends the morning in bed with Paul Sheringham, the heir to said estate. It is Mothering Sunday in England, and so the servants are gone for the day, and Paul's parents are at a lunch with his fiancee's family. Paul leaves Jane to meet his fiancee for lunch early in the afternoon. Jane - who was a foundling and has been in service since she was 15 - wanders the house before she leaves, wondering what secrets it holds and what the servants will think has happened when they return. She knows it is the last time she will be with Paul, since he is getting married, and the thought makes her sad. The book then moves to Jane at ninety-something. She has become a famed writer, and is talking about the kinds of questions interviewers always ask her. She ponders what makes all of us tick, what gives us our stories, what parts are really true and why. Her husband has been dead for forty years, and they were childless, so her books are the things that she is leaving to the world. The story of Mothering Sunday 1924 is woven throughout the book and throughout Jane's life. It's a lovely, small book evoking a time and a place, and giving the reader pause to think about their own story. Better Than Before : Mastering the Habits of Our Everyday Lives by Gretchen Rubin. I read this book after reading someone's review on their blog about how they liked it, because it helped them understand how/why/if they could change old habits and learn new ones. I'm not one much for self-help books, but I do like ones that discuss how someone found a way to do something to improve themselves. I found Rubin's earlier book "The Happiness Project" to be interesting, and thought this was worth a try. I didn't *not* like this book. 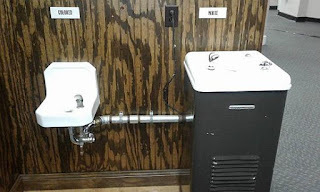 I just think it could have been a lot shorter. The good things about it were that it gave you some tools to see how your personality might react to creating or kicking habits and suggests ways to make it work for you. I found that part really helpful. But I felt there was just too much other stuff here. I have no problem with her providing examples to illustrate things, either. That was valuable. My issue was that it just seemed to me that the book could have been as interesting and as effective if so much wasn't there that struck me as filler. I found myself skimming/barely reading the last parts and for me at least, that's never a good thing. Geek Girl by Holly Smale. A quick, enjoyable, but too-pat read. This is a book that is classified as "Teen" literature. It's the story of, and narrate by, Harriet Manners. She is the titular Geek Girl, and at the beginning of the book, is more or less proud of herself. A chance event that happens at a school field trip propels her into the world of a supermodel. And she learns a lot about herself, and those around her. As I said, it was a quick read, and Harriet was an enjoyable character. But I felt that, even for teenage level, the ending was just too-pat and formulaic. I'm 100% sure that I would have felt that way as a teen too. Granted, when I was a teenager I had already been reading books above my reading level for years, but I still enjoyed quite a few things written for my age level. Pardonable Lies by Jacqueline Winspear. I listened to this as an audiobook, and really enjoyed it. I'm not very far into this series, but I have to say that I think the characters are developing nicely. In this book, Maisie Dobbs experiences some life-changing events and finds out news regarding her mentor that shock her. But by the end of the book she is figuring out how to move forward. Maisie is hired by a man whose last promise to his wife was that he would get final proof that their son was killed in a plane crash in World War I; a psychic told her that he was still alive somewhere. Though the gentleman is convinced the son is dead, he feels an obligation to his wife to at least carry out her wishes. What follows is a series of events that tie together various stories, and reveal a plot against Maisie. I liked the way that the author intertwined Maisie's latest investigation with one of her friends, a member of Parliament, and Maisie facing her past. It was smooth and not contrived. Though some things I had guessed before they were actually revealed in the book, I think that was what the author intended. A very readable entry in this series, I look forward to the next one. Career of Evil by Robert Galbraith. I have to say that I am enjoying this series, with Cormoran Strike and Robin Ellacourt. This most recent one builds on the characters' relationships with one another, and with some of the secondary characters (old and new) involved in their work and their lives. When a severed leg is delivered to the office, addressed to Robin, the story begins. There is a note attached with lyrics from a song by Blue Oyster Cult. With that, and the fact that the mailing label shows that the package was originally addressed to Strike, the "game" begins. Strike feels strongly that it might be his late mother's last husband, a rock star wannabe/groupie who Strike believes killed her, even though he was exonerated in court. As things go along, Strike realizes that there are three other people from his army days who could also be involved, and so the investigation begins. In the meantime, Robin is dealing with the lead up to her wedding, and that personal story plays a large part in this book as well. This book is somewhat creepy, but the story keeps you reading and there are so many back-and-forth clues for the reader that you are not sure where you'll end up. I also learned from this book that there are people with a psychiatric disorder called Body Integrity Identity Disorder (BIID), where a person who is healthy feels that they will only be "whole" if they are somehow disabled (i.e, they feel the need to have a limb amputated). This disorder plays a major role in part of this story. I like Cormoran and Robin, and am hoping that there will be further books in this series. I feel that each book is a little bit stronger than the last. Every Fifteen Minutes by Lisa Scottoline. This was a real page-turner. I have been ambivalent about some of Lisa Scottoline's non-Mary DiNunzio books, but this one was a good read. The story involves Eric Parrish, a pscyhiatrist who is well-respected both personally and professionally. Unfortunately, his marriage has ended, and he is worried about custody issues involving his young daughter. Then he takes on a teenager who is suffering from depression and OCD. When the teen's grandmother (who raised him) dies, he disappears. Then a girl he had talked about with Eric turns up dead. Eric becomes frantic to find the teen, and as a result of his actions, also becomes a suspect in the case. One of the things I liked about this book was the conflict between what a doctor can reveal about a patient that will not compromise confidentiality, and what law enforcement sees as obstruction. Lisa Scottoline managed to make this conflict understandable from the viewpoint of everyone involved, and it did make me think of how we are so quick to judge people who don't spill everything they know about anyone who is a suspect. Another thing I liked in the book was the true mystery of who the person who occasionally "writes" a chapter as the sociopath. At first you make the most obvious assumption, but as the story progresses, you have doubts. I decided another character was behind everything, but to be honest, I was truly surprised to find out who was the guilty party. I mean, really surprised. I Capture the Castle by Dodie Smith. This book is essentially the journals of Cassandra Mortmain, a young girl living in a ruined castle in Suffolk with her penniless family. The whole story takes place over a six-month period during 1934, and though at the start, the Mortmain family is barely eking out an existence, having sold any valuables in order to just keep going, their fortunes change over the course of the book. Cassandra is an avid writer, and keen observer of life and other people, and also somewhat of a romantic. Needless to say, since we are hearing the stories from her viewpoint, we see the characters through the lens of a seventeen-year-old girl. But she is well worth getting to know, and though there were some parts of the story that dragged a bit, it is overall very well-done. Dodie Smith has managed to create characters that are vividly drawn, and evokes a place and time that we tend to think about as a more innocent time, but that in reality was just as complicated in its own way as today is. Personal relationships, worries about money - it's all just variations on a theme. This was a nice change from a lot of books I've read lately. The Almost Nearly Perfect People : Behind the Myth of the Scandinavian Utopia by Michael Booth. I have always wanted to visit the Scandinavian countries, because they sound like they would be beautiful and different, and everyone I know who has visited, has had a wonderful time. The author of this book married a Danish woman, and they live in Denmark. His personal experiences and observations are not always in sync with what you read about Denmark and other countries in Scandinavia. He decided to visit each place and do a personal study to determine what is true and what is myth, or even situational truth. I really enjoyed this book, and I learned a lot about the different Scandinavian societies, and also how they view each other. Booth's style of writing is more or less conversational, so you feel like he is telling *you* about his travels and his findings. Well, I certainly had more to say than I realized about what I'd read! Let me know if you read/have read any of these and how you did or did not like them. And if you have something to recommend, please do! But Kathy has her weekly list of questions, so why not answer them today? After a long day of knitting, would you rather: a) soak in a hot tub, b) have a massage, c) have a manicure. I seldom knit for really long periods of time, but even so, I like to soak in the tub, especially in a bubble bath! I don't do it often, so it feels extremely decadent. Many of us are sock knitters. Have you ever put rubber dots on the sock bottoms for slippage? When was your last pedi? 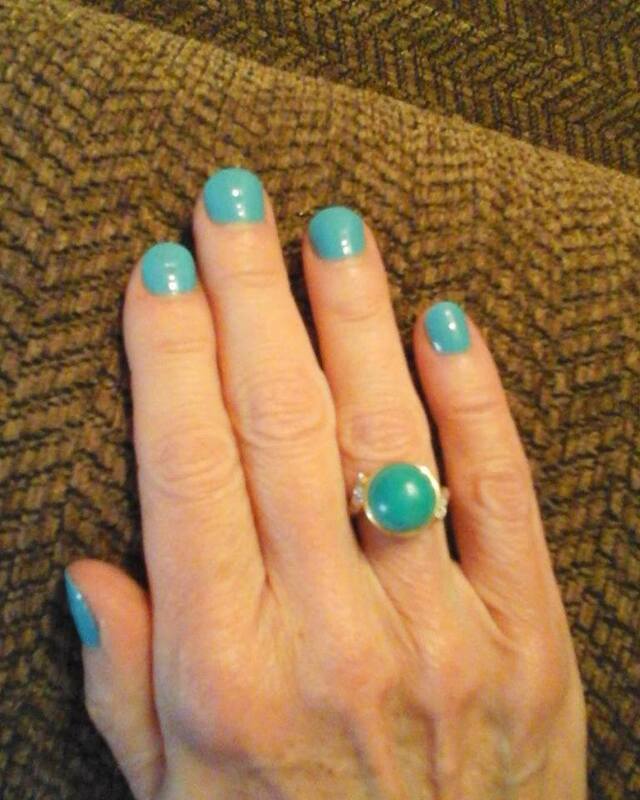 I treated myself to a professional pedicure about three weeks ago. 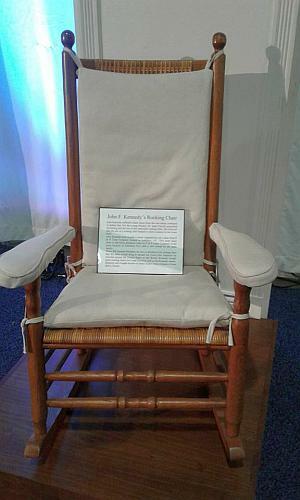 I was thinking about giving myself one this past weekend, but my low-energy-existence meant that it just never happened. Are you waiting for anything to bloom in your garden? My garden consists of only a few plants in pots this year, and they are all blooming or have bloomed. We are waiting for The Tim's deck garden to bloom though. So far, the lettuces, argula, and herbs have been happy, but we're waiting on the other stuff. A couple of the cucumber plants in particular look like something will happen Any.Day.Now. Do you own anything at all, anything, solar powered? Nope. We had some deck lights a few years back that were supposed to be solar powered, but they were a bust. *We're* not even solar powered! So many [Chicago] Cubs are in the All-Star lineup this year ... will you watch the home run contest of the game? Both? Neither? I always watch the game (well, if it runs late I usually miss the end), but I almost always forget about the home run contest, and miss it altogether. Finally, your name for winter yarns were all amazingly awesome. Let's try again. Name a Midsummer yarn colorway. How Is It Sunday Night Already? What a weekend. So many sad, tragic, terrible and scary things happening in the world. It's hard to wrap my head around a lot of it. Not because I'm a perfect person, just because I don't understand what causes so many people to do the things they do. It can certainly fill you with despair. Fortunately, there are also good things, and I have been making an effort even more than usual to recognize and appreciate them. I've been working on doing that lately anyway, so that I can find something to smile about every day. This weekend I didn't accomplish as much around the house or garden as I'd hoped, mostly because I didn't feel too great. Not really sick or anything, just the kind of low-energy thing that comes along every once in a while. Fortunately, there was no place I had to be, so other than just not getting things done, it didn't effect mine or anyone else's plans. I did manage to finish a knitting project and a book I was reading. The Slutty Pumpkin socks are ready to be mailed to my niece once I get a mailing envelope. I'm pleased with how they turned out, and you can look forward to a post about them this week. So, OK, reading over this, I guess it should be Sunday night. Oh well, time marches on, even when I'm only crawling. Hello there - am I the only one surprised that July 4th was just this past Monday? I realized it earlier, and felt rather amazed to be honest. Oh well. Anyway, I thought I'd share another recipe today. This one is nice because it is a) quick, b) filling, and c) doesn't make you want to pass out in the kitchen during hot weather when you are cooking. It's based on a recipe I saw here, and really both are as much a template as anything. Meaning that it's up to the cook to add different herbs or other seasonings, more/less garlic, whatever you want to try. I've made this a few times this summer so far, and it's been yummy each time. This makes enough for The Tim and I to have a very hearty meal on its own - you could probably add a salad or appetizer and stretch it for guests, or double the recipe for more people. Heat mixture in the saucepan until it begins to thicken, and starts to boil. Drain pasta, and put it back into the pan. Pour sauce over pasta, and mix thoroughly, coating the pasta. Place in bowls and top with cheese and pepper. *edited - earlier "milk" was listed as "mild" - even though I proofread the post twice! Thanks to those who asked about that. Pretty straightforward, huh? Let me know if you try it, and have a great weekend! So - THANK YOU FOR EVERYTHING. I really felt comfort knowing you cared so very much. We are still kind of in shock, but as all of you know, life goes on no matter what, and some things have to be done regardless of what else has or has not happened. All of us are doing our best to adjust, some days are harder than others, as I'm sure many of you know. 1. We all have our Christmas movie favorites. Do you have a summer movie you watch over and over? I usually watch at least part of "Yankee Doodle Dandy" with Jimmy Cagney on/around the 4th of July. It's so cornball, and we always watched it growing up. I think I might be able to recite it. 2. How's your Holiday 2016 knitting coming along? I'm only slightly behind, but the things I am planning to knit as gifts are pretty quick knits, so I'm hoping to have a couple more completed by the end of the month. So far, I have one hat out of 3 completed, and 1/2 of a shawlette completed out of 4 I hope to make. 3. I have more time to read in summer than around the winter holidays. What have you read lately? I recently finished the third installment of the Maisie Dobbs stories, which was interesting. But my favorite book that I finished most recently was A Man Called Ove. I listened to the audiobook, and it has become one of my favorite books of all time. 4. Is there anything better than an iced Christmas cookie? I seldom have iced Christmas cookies ... but during the summer, nothing beats a gelati from Rita's. Nothing! 5. Have you knit a gnome? No, but I have a couple of little ones knitted and then felted by someone else that I've bought at Maryland Sheep and Wool a couple of different times. One is just a cutie, and one is a Santa gnome. 6. Are you more excited about your Christmas tree or your summer garden? I've been fixing up our garden, and it's really nice. The Tim has a deck garden where he is growing veggies and herbs. They are great. But nothing is better than a Christmas tree! 7. You've just created your favorite winter colorway. What do you call it? 8. Someone is secretly knitting you a Christmas gift. What do you wish it to be? Christmas themed/colored socks or fairisle mittens. 9. If you need snow for the perfect Christmas, what do you need for the perfect 4th of July? Temperatures during the day in the upper 70s, sunny with no humidity, and a cool, clear evening. 10. Let's make the last one yes or no; are you knitting in the air conditioning today? Thank you again everyone. For every single thing.